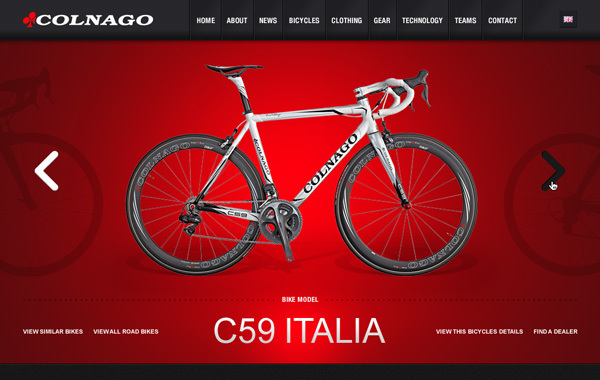 The brief was a full re-design of Colnago's existing website. Designed in mind that it will be content managed via WordPress (to be built elsewhere). 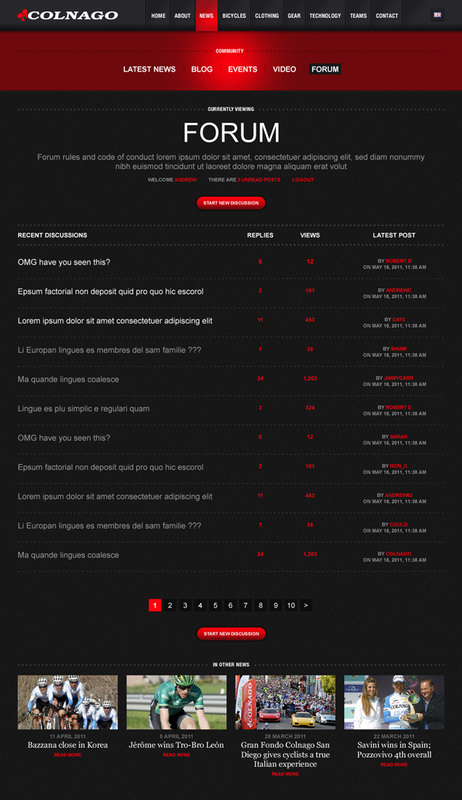 In the first instance I delivered a set of several wireframes exploring various ideas, content, structure and layouts. I was again asked (later) to design the final GUI. The initial wireframes explored a cleaner/white interface (see further down this page), but the style and structural (client) requirements changed from the original wireframes to the GUI stage, to a more "Ferrari"/polished themed look, by request. A nice large hero image of the bike, with 'hotspots' to hover over to reveal details of elements of the bike. 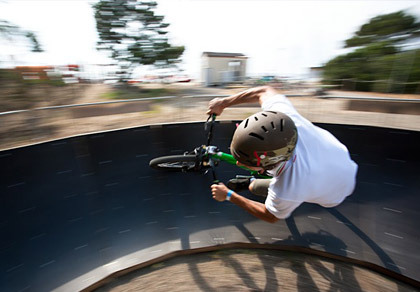 The feature panel at the top is interchangeable between a slider to view feature bikes, or an editorial view with a large image and blog title (see next template). This is useful for focusing the site on editorial around, for example, the Tour de France, and to shift focus back to their bikes at other times. 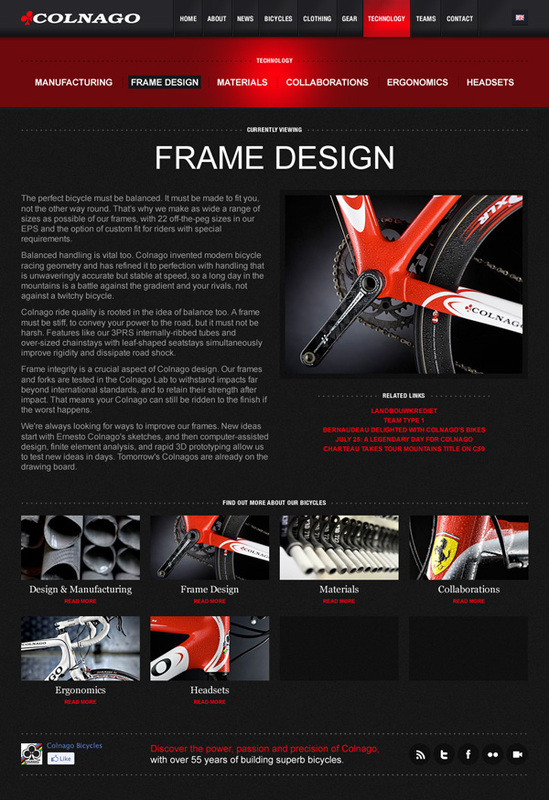 Overview with plenty of links into the various different sections, blog, features and products. With the editorial feature panel at the top (see previous template caption). The location of places their bicycles can be viewed/purchased. 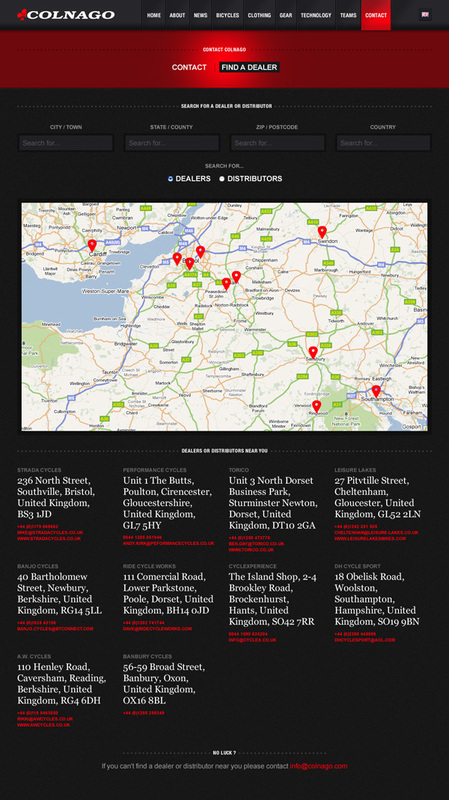 The map is searchable via the filters at the top... On search the map and dealer information below both change. Used for a number of pages. 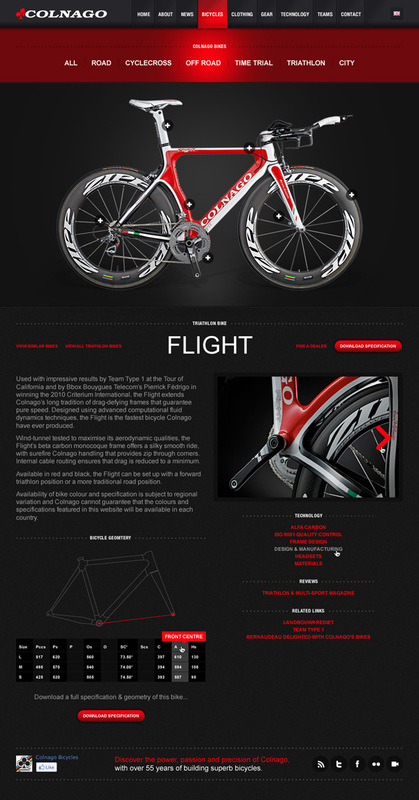 Ample space for text, a feature bike detail image and plenty of cross-sells for retention. A bespoke forum based on the phpBB forum framework, but with all the clutter and unnecessary features stripped out to focus on what's useful, for a better user experience.